The folk-memory of Britain in the years before the Great War is of a powerful, contented, orderly and thriving country. In this warts-and-all portrait, leading historian, journalist, author and political commentator Simon Heffer exposes the contradictions and reveals what was really going on in late-Victorian and Edwardian Britain. Simon will be interviewed by journalist, writer and broadcaster Francis Wheen. The folk-memory of Britain in the years before the Great War is of a powerful, contented, orderly and thriving country. She commanded a vast empire. She bestrode international commerce. Her citizens were living longer, profiting from civil liberties their grandparents only dreamt of, and enjoying an expanding range of comforts and pastimes. The mood of pride and self-confidence is familiar from Elgar’s Pomp and Circumstance marches, newsreels of George V’s coronation and the London’s great Edwardian palaces. Yet things were very different below the surface. 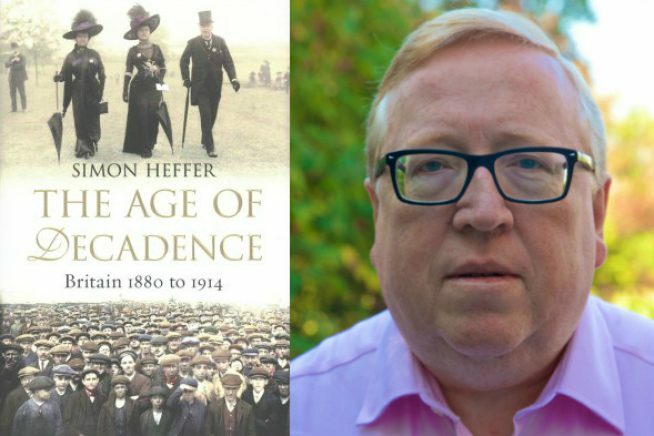 In The Age of Decadence Simon Heffer exposes the contradictions of late-Victorian and Edwardian Britain. He explains how, despite the nation’s massive power, a mismanaged war against the Boers in South Africa created profound doubts about her imperial destiny. He shows how attempts to secure vital social reforms prompted the twentieth century’s gravest constitutional crisis and coincided with the worst industrial unrest in British history. He describes how politicians who conceded the vote to millions more men disregarded women so utterly that female suffragists’ public protest bordered on terrorism. He depicts a ruling class that fell prey to degeneracy and scandal. He analyses a national psyche that embraced the motor-car, the sensationalist press and the science fiction of H. G. Wells, but also the Arts and Crafts of William Morris and the nostalgia of A. E. Housman. And he concludes with the crisis that in the summer of 1914 threatened the existence of the United Kingdom – a looming civil war in Ireland. He lights up the era through vivid pen-portraits of the great men and women of the day – including Gladstone, Parnell, Asquith and Churchill, but also Mrs Pankhurst, Beatrice Webb, Baden-Powell, Wilde and Shaw – creating a richly detailed panorama of a great power that, through both accident and arrogance, was forced to face potentially fatal challenges.